Mahindra GippsAero, the Australian aircraft company and subsidiary of the $14.4 billion Mahindra Group, has effectively accomplished the debut flight of the latest airplane, the GA10. 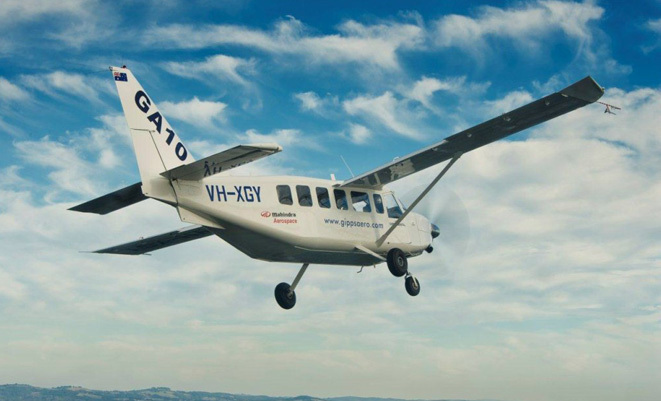 This is the first ever aircraft created with single turbo-prop developed in Australia, the 10 seat, multi function aircraft based on the iconic GA8 eight seat utility aircraft. The debut flight was arranged at GippsAero’s home base at Latrobe Regional Airport in eastern Victoria on Tuesday the 1st of May 2012. Powering the GA 10 is a Rolls Royce 250 turbo-prop engine, which holds a distinctive position in the market and will go well with an extensive number of functions from commuter and cargo work to sky survey and inspection roles. Test Pilot, Tony Morris and GippsAero Flight Test Engineer, Gerhard Jordaan took the first flight in the GA10 for this unforgettable event. Once airborne, the GA10 circled the airport a number of times for about 20 minutes in addition to one near to the ground approach including a go-around. “The triumphant trial flight of the GA 10 symbolizes an additional milestone achieved for Mahindra Aerospace following the launch of the NM5 in September last year and places India on the global aviation map. Powering the GA10 is a Rolls Royce 250 turbo-prop engine, which holds a distinctive position in the market and will go well with an extensive number of functions from commuter and cargo work to sky survey and inspection roles and I am certain that users will opt the GA 10 as a scaleable feasible, multi function aircraft with the benefits of turbo prop technology. We plan to launch the GA 10 in India soon as well,” said Mr. Hemant Luthra, President, Mahindra Systech. With the conclusion of the debut flight, the GippsAero engineering team will issue the prototype to a concentrated program of standing and air tests to receive a CASA Type Certificate for the GA 10. It can be predicted that the fresh variety will be on hand for customer delivery in the first half of 2013. The company is yet to declare particulars of a deposit course, which will present a chance for potential buyers to confirm an acquisition spot. Next PostNext VW Jetta going to be the most fuel-efficient car in its segment?